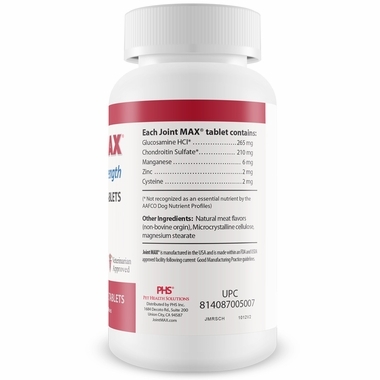 Joint Max® Regular Strength (RS) for dogs and cats is recommended for joint health with powerful active ingredients that enhance the functions of joint and connective tissue as well as antioxidants to help reduce oxidative stress. 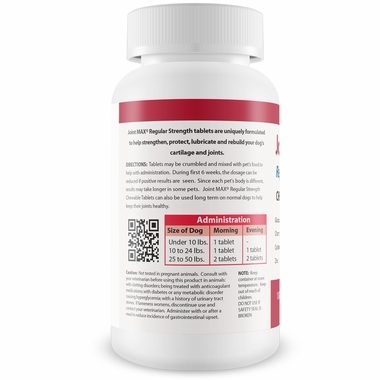 It contains Glucosamine, Chondroitin, Vitamin C, Cysteine, Manganese, and Zinc. These powerful active ingredients combined with beef flavor create one tasty, chewable tablet that enhances bone and joint health. Tablets may be crumbled and mixed with pet's food to help with administration. During first 6 weeks, the dosage can be reduced if positive results are seen. 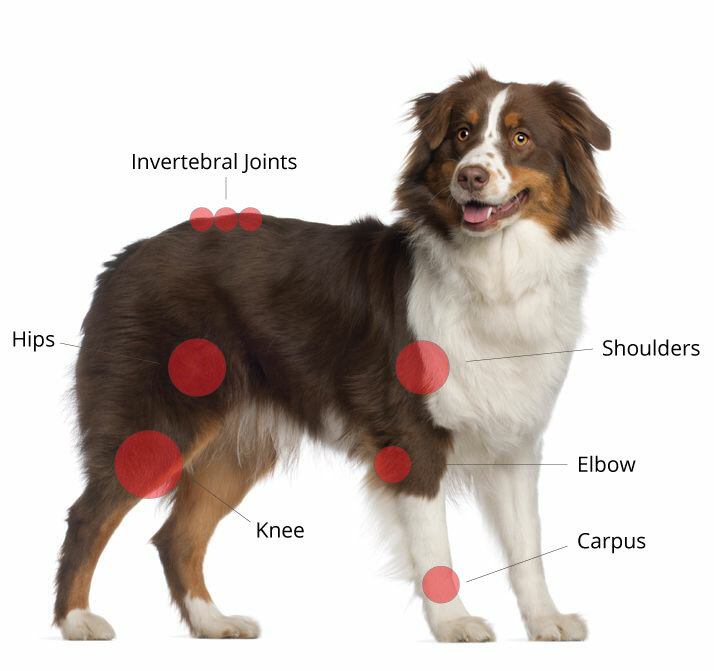 Since each pet's body is different, results may take longer in some pets. 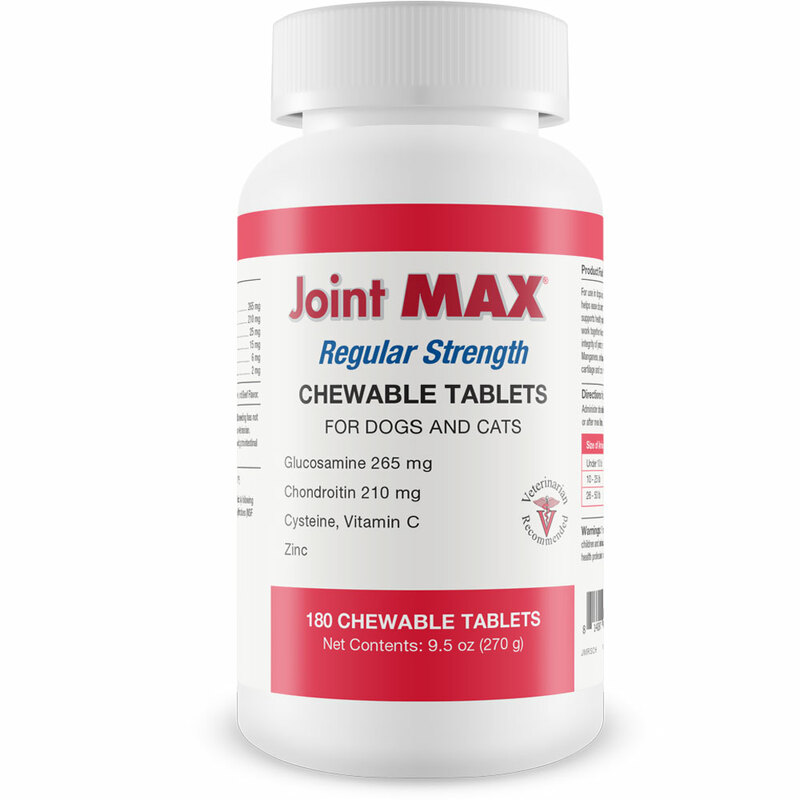 Joint MAX® Regular Strength Chewable Tablets can also be used long term on normal dogs to help keep their joints healthy. CAUTIONS: Not tested in pregnant animals. Consult with your veterinarian before using this product in animals: with clotting disorders; being treated with anticoagulant medicationsl with diabetes or any metabolic disorder causing hyperglycemia; with a history of urinary tract stone. If lameness worsens, discontinue use and contact your veterinarian. 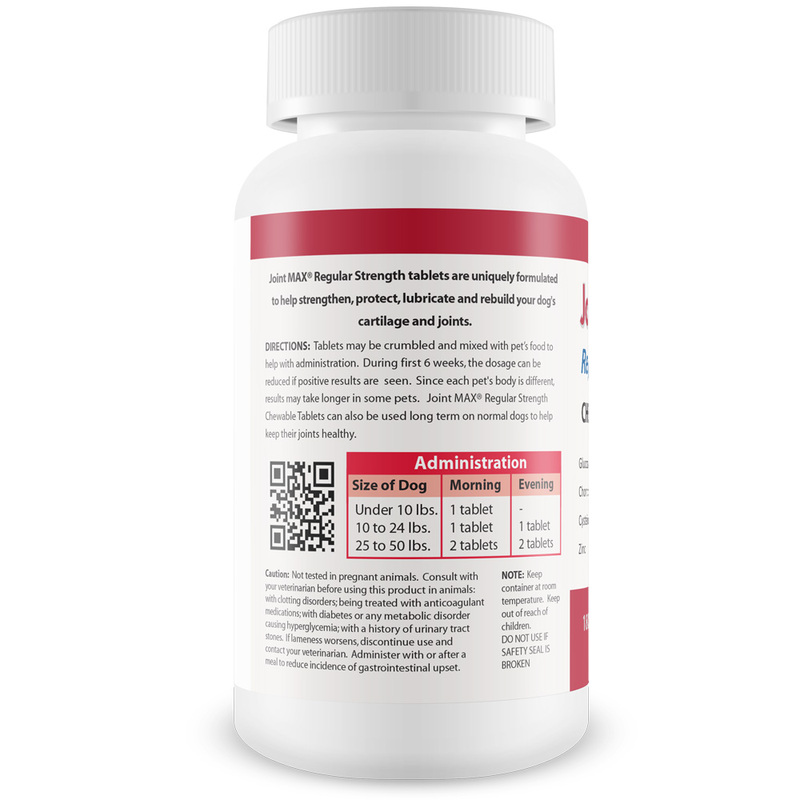 Administer with or after a meal to reduce incidence of gastrointestinal upset. My fur baby loves this product!!! I bought this joint supplement for my 16 year old calico, Callie. She's very finicky about food, treats you name it. I've tried so many other joint supplements from other companies and she'd turn her nose up at them. I was searching for this type of product and came across your site. I thought what the heck I'll try it. She immediately started smelling it as I was cutting it in pieces and putting it in her dry food. She loved it. It's been going on 2weeks now and she's not limping quit as bad. Please don't stop selling or change this product. I would recommend this to anyone w/a finicky cat. Thank you!! Gracie B.